Image courtesy of Jonathan Thompson / Pixlpix Photography. Creating earthenware objects of both practical use and aesthetic beauty from surrounding raw materials is a timeless activity – humankind has been doing it for thousands of years. Starting with the natural process of digging clay from seams within the earth, objects for use or simply decoration are moulded, fired and glazed in situ within the natural environment from whence they came. 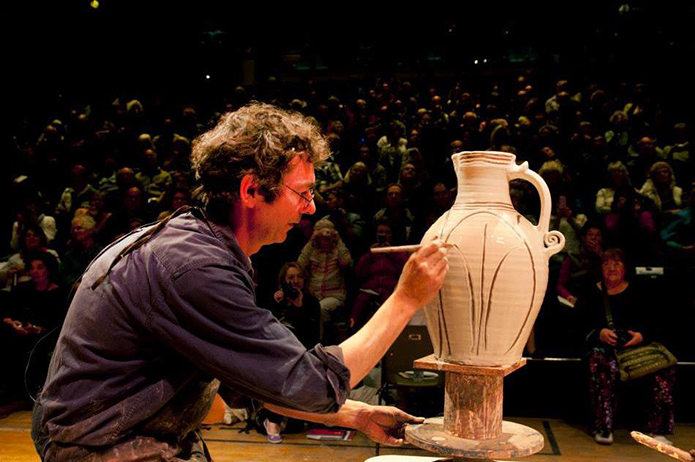 Potters in Britain have been creating such objects, mostly vessels and especially jugs, formed from local clays, and decorated using a simple palette of traditional slips (a suspension of clays or other materials in water) and glazes, sourced again from immediate raw materials, since medieval times until the turn of the 20th Century. Traditional English country slipware pottery is distinctive in its simple, rustic, yet vibrant style; it is often gritty and utilitarian at the same time as being decorative and easy on the eye. 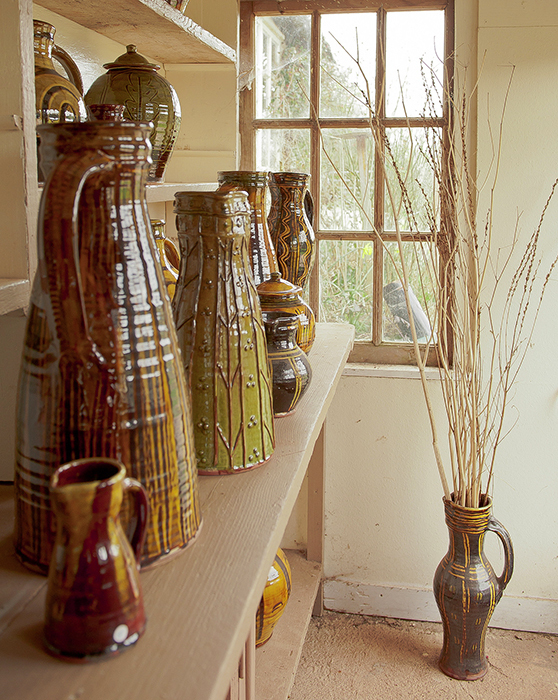 This slip decorated country pottery tradition has influenced esteemed slipware potter Douglas Fitch, who is based in deepest, darkest Devon, but has gained an international reputation, including being the subject in a film that featured at the Ceramics and Glass Film Festival in Montpelier entitled Hollyford Harvest. Here we are lucky enough to enter Douglas’s world as a rural potter, albeit for too short a time to fully understand, but certainly long enough to more than appreciate, the pull of potting. 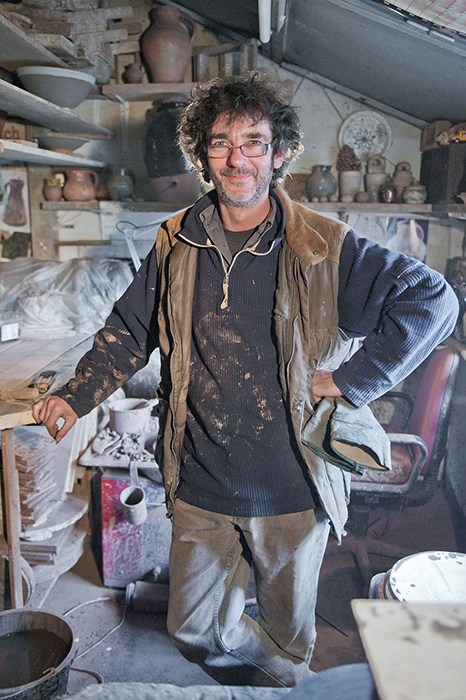 Douglas has been a potter, firstly as a hobby after studying pottery at Derbyshire College of Higher Education in the 1980s, for over a quarter of a century, but more recently pottery has become his sole occupation, drawing from the skills and techniques demonstrated within the work of master craftspeople of the past, using a traditional potter’s wheel and wood-fired kiln whenever possible, as well as the inevitable inspiration from natural environment, which idyllically encroaches upon his country workshop, with its ever changing seasonality of colours, tones and textures. Firstly, for those readers that aren’t familiar with Douglas Fitch, please can you explain what you do? I make earthenware by traditional techniques and using traditional materials, influenced by English earthenware over the past few centuries, but in a contemporary fashion. 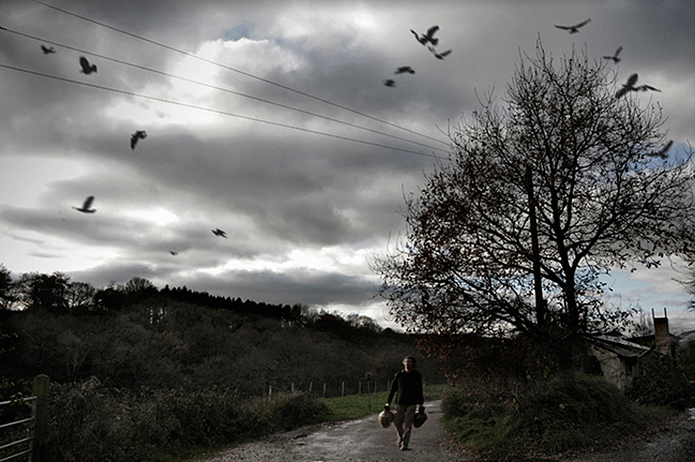 Image courtesy of Claire Borlase Photography. What were the reasons for deciding to solely work in earthenware clay? Earthenware clay is the traditional material of this country. I enjoy the aesthetic of earthenware – the worn look and beautiful patina is very appealing, and I feel that old earthenware pots have a ‘life’; scars from having lived. I also like the low firing temperature qualities of earthenware. 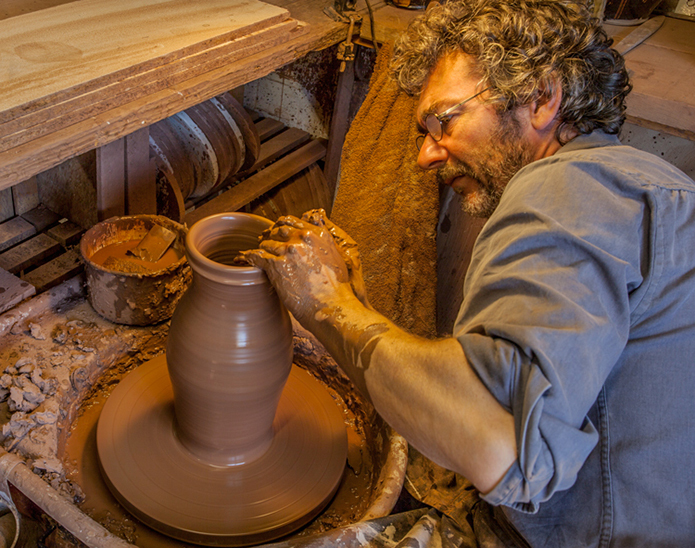 Your designs are influenced, in part, by the work of medieval potters of England. Is it just this period that interests you, or are you inspired by the work of any more modern potters? My work is heavily influenced by historic potters from the medieval period right up to the 1960s; I love the history of rustic pots being made for rural communities, such as pig salters for salting hams, bread pancheons for bread-making, pitchers to fetch water from the local well, and so on. 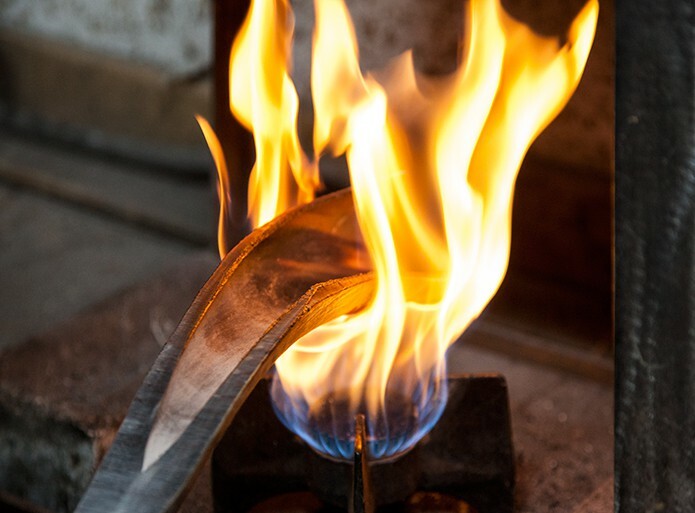 The products needed to be made cheaply, as people didn’t have a lot of money in those days, and they would often get broken, so the makers of these pots would have to be highly skilled, as they needed to be able to make the pots at speed and in volume. 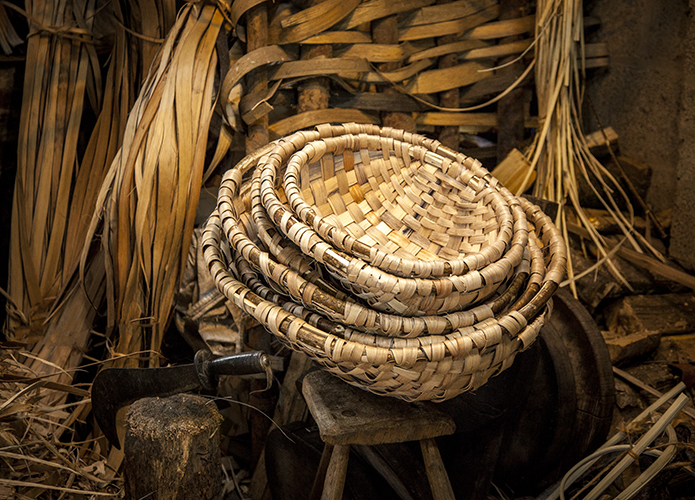 These were highly skilled craftsmen, as they sought to eliminate all the parts of the process that took time, and I have studied their work in depth and tried to emulate the skills of these great craftsmen. 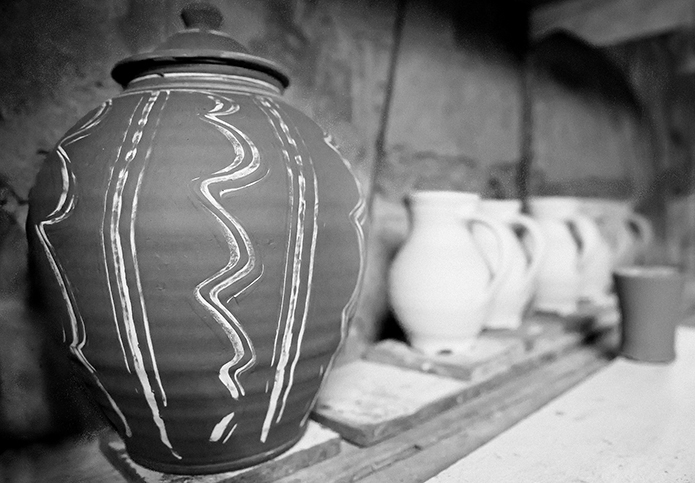 The pots they made are brought to life by the way they were thrown and the marks that were made whilst they were being made. 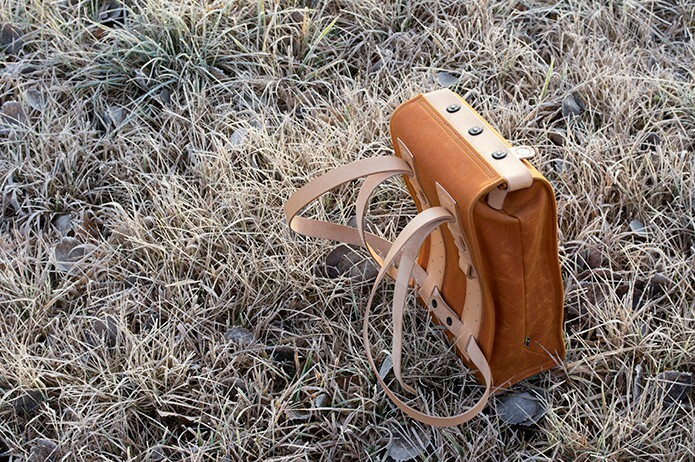 Of course, with the advent of electricity and running water, the demand for these items is not really there any more, but it’s certainly good for inspiration into my designs. Sadly, many of these potters died in the First World War, which took out a lot of the skill base of slipware potters. There’s a lovely film about Isaac Button, called Country Potter, who was one of the last of the rural potters making country pottery and rustic ware, which gives an insight into this world. Many contemporary potters have inspired me and my work. 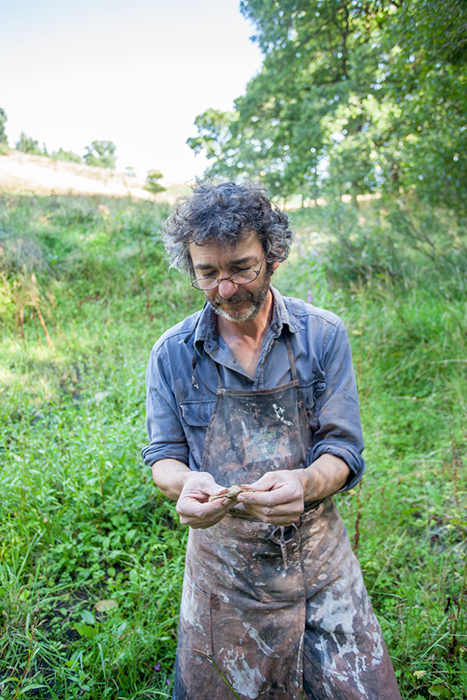 Michael Cardew, the first apprentice of Bernard Leach, who himself had developed the whole philosophy that pottery was an art form, has really inspired my work. His work on the English slipware tradition, and his life story where he really struggled, certainly resonates with me. 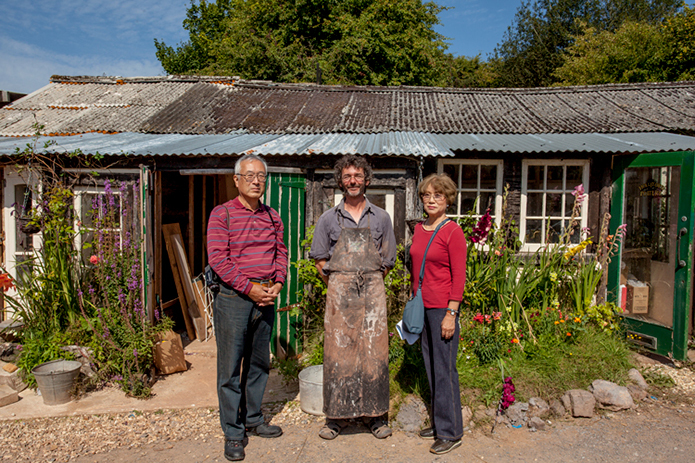 The likes of Clive Bowen and Svend Bayer, both who had worked with Michael Cardew, are important influences, and also Nic Collins, who I studied with in Derbyshire, but set up his studio on Dartmoor many years ago, has been a massive influence; he’s visionary, determined and uncompromising, and I really admire his integrity – he’s been a huge help to me! Finally, my partner and fellow slipware potter, Hannah McAndrew, who I’ve talked to about pots daily for the past ten years, and we’ve grown together; she has been a massive influence on me and my work. Your clay jugs are very distinctive; how did you settle on the textures and colours used? 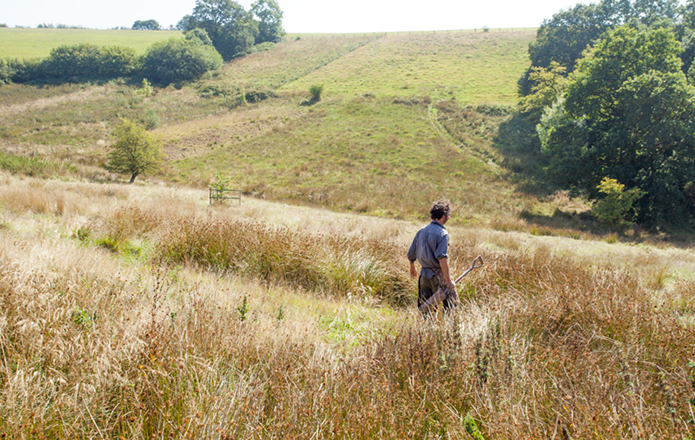 I’m certainly influenced by nature; the colours, textures and materials of the countryside around me are reflected in my work, such as the red-coloured fields that surround me are as a result of the iron and the clay, and it’s that clay that I utilise in my work. It’s the same visual stimuli that would have influenced medieval potters centuries ago, they would have been influenced by what was available to them, such as red clays to make the pots, and then white clays to make the slip for decoration. Devon is fortunate in that it has both red and white clay close to each other, but it’s not specific to Devon though. In what way does your immediate working environment influence your work? 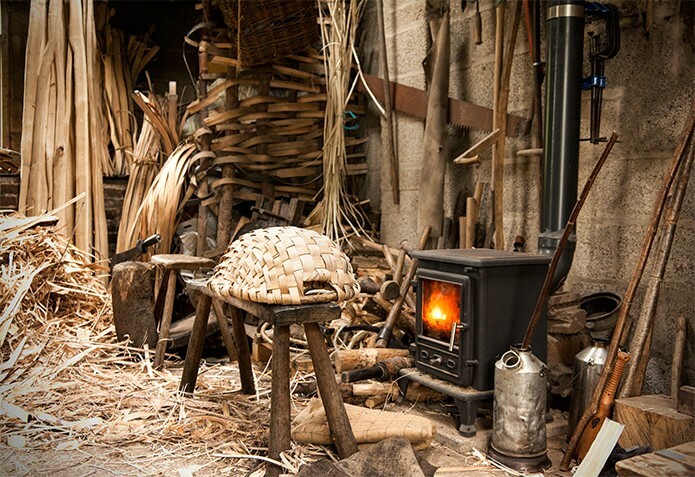 I work in a shed in the middle of the countryside, which is a very similar environment to that which potters in the past would have worked. I dig clay from a prehistoric, dried up river valley in an adjoining field that I use to make my pots; it’s comes out of the ground yellow due to the iron oxides contained within it, but it dries a terracotta colour – I love the smell of it – it’s damp and ‘earthy’, and really plastic and responsive – far better than the clay from Stoke! 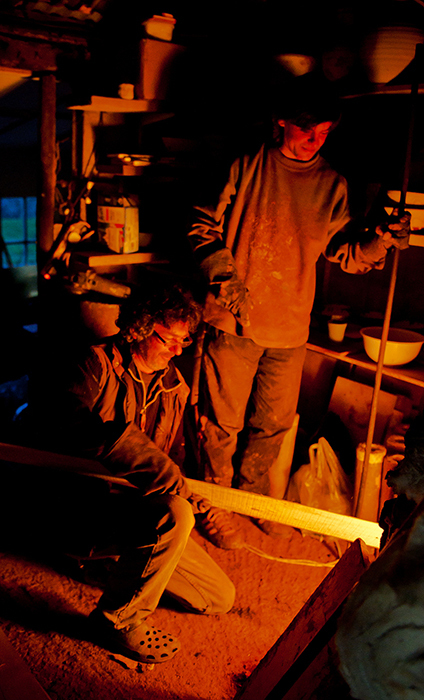 I source wood to fire the kilns from local woods, and I’m working miles from the nearest urban centre. 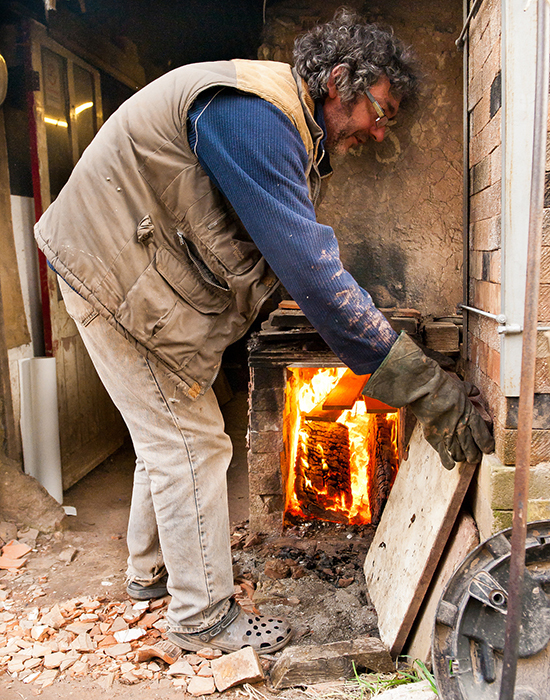 In previous centuries, potters were situated in rural areas so they could be close to their source of materials, and also to ensure the smoke from the kilns didn’t affect the health of those living in the towns. Potters were notorious for digging up clay from roads, it’s where the term ‘pot holes’ is derived from, and so another reason for ensuring that potters were situated in rural areas so they caused fewer problems! I certainly feel the environment that I work in allows me to connect with the work that I’m making. I’m very intrigued that you dig your own clay; does it need to be refined in any way before it can be used? It is possible to use the clay directly from the ground, but I prefer to sieve it first, as you run the risk of some unwanted grit where you don’t want it. The clay is put into a big mixer, a blunger, where water is added to form a runny suspension, which is the slip. The liquid is then poured through a tap into a sieve, where grit, grass and any bone fragments are collected and discarded. The remaining liquid, which is pure clay and water, is then put into a trough, called a sunpan, which is placed outside so the sun and wind can drive off the moisture, until it toughens up into a plastic state. The clay is then put through a pug mill, and grit is added to give it some texture and ‘tooth’, so it can be worked. 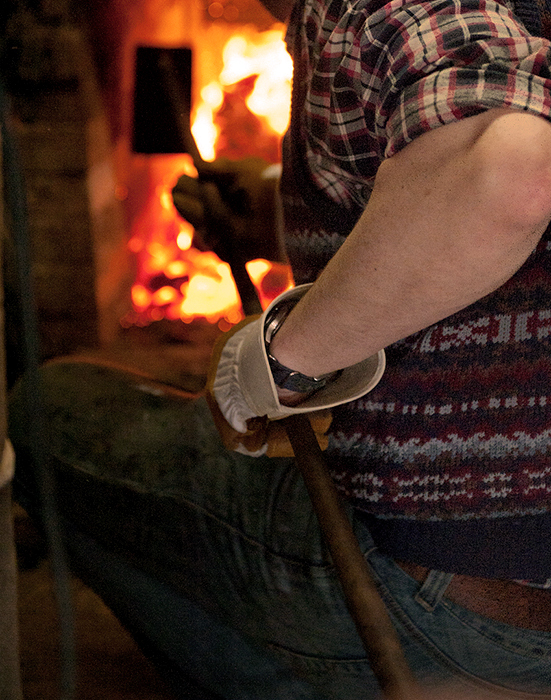 Can you talk through the thought process of how and why you became a potter? I first became interested in earthenware as a result of my early interest in archaeology; I was a member of the school archaeology society and the headmaster of the school, a published archaeologist, took us to various medieval pottery sites, where I found shards of old earthenware pottery in the ground. He then showed us pictures of what the fully constructed pots would have looked like when they were complete. I developed my interest further with a visit to the Victoria & Albert Museum in London when I was about eighteen, and I saw further examples of the pots that I had dug up many years before, and things started to make sense to me. 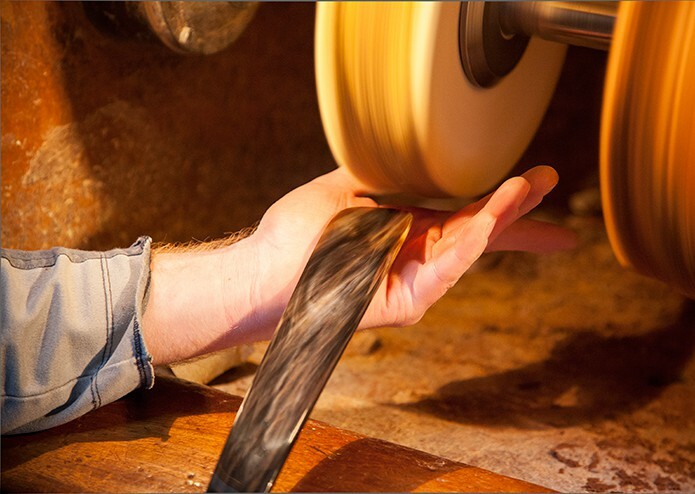 I enrolled on a pottery course and during the course we were shown the different contrasting sides of pottery – the production line approach, such as Royal Worcester, and handmade pottery, such as Winchcombe Pottery, where Eddie Hopkins was doing a demo throwing pots on the wheel. It was at that moment that I knew I wanted to be a studio potter and production line pottery held no appeal. I believe it was my calling in life to become a slipware potter. Whilst it can be tough, particularly if you’re having a bad day and not throwing pots as you’d like, and the fact that it’s not financially rewarding, it’s incredibly enriching in other aspects, and I’ve been fortunate to meet some fantastic people. It’s possible to travel the world, conduct workshops in faraway places, staying with other potters as hosts, and attending exhibitions and galleries, which isn’t necessarily the case in other walks of life. 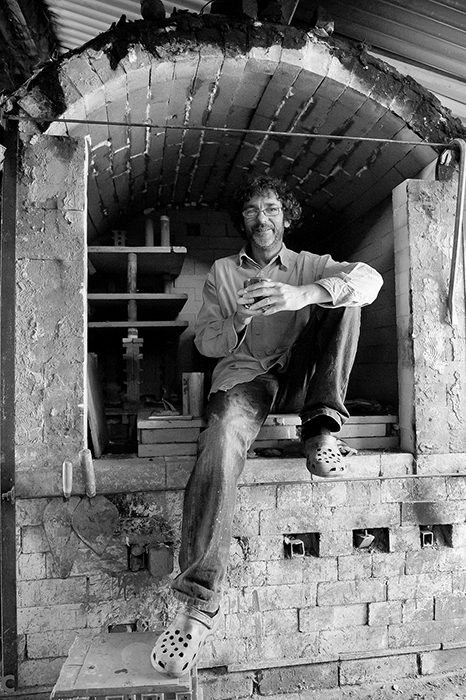 In the pottery fraternity everyone really looks after each other; last year, for instance, an American potter, Adam Field, stayed with me for a month, and he worked in the workshop, and toured the UK, and it was a great experience for him and me. You have recently been exhibiting in Slovenia and Japan, not to mention all corners of the UK. Can you describe the challenges of taking part in an exhibition; particularly those overseas? It’s actually quite a terrifying experience, when you consider that I spend the vast amount of my life in the middle of the Devon countryside, and then I’m travelling the other side of the world; it’s immensely challenging! Logistically it’s quite tough, arranging for my pottery to be weighed, measured, packed carefully, booking couriers and finally dispatching so that it arrives at the right place when I need it to be there -unbroken. Image courtesy of the International Ceramics Festival. It’s also a challenge knowing what to take with me in the first place; one thing that I didn’t appreciate before I started overseas exhibitions is what type of pottery to take with me – the pottery of each country is heavily influenced by the type of food and drink consumed there, so the pottery that is likely to sell has to be of a kind that is relevant to that country. For instance, the Japanese tend to favour smaller items such as small cups and bowls, and they’re not so interested in large jugs, as they don’t really have space for large items in their homes. It has to be said the Japanese really do appreciate their handmade pottery – in Britain, for instance, hardly anyone eats from handmade pottery, in Japan it’s the opposite, and it’s viewed as the highest art form. The Japanese use different pots for different purposes; in some ways it’s comparable to cutlery in Britain – we have fish knives, dessert spoons, tea spoons etc, and the Japanese have pots for rice, plates for puddings etc; all hand made. 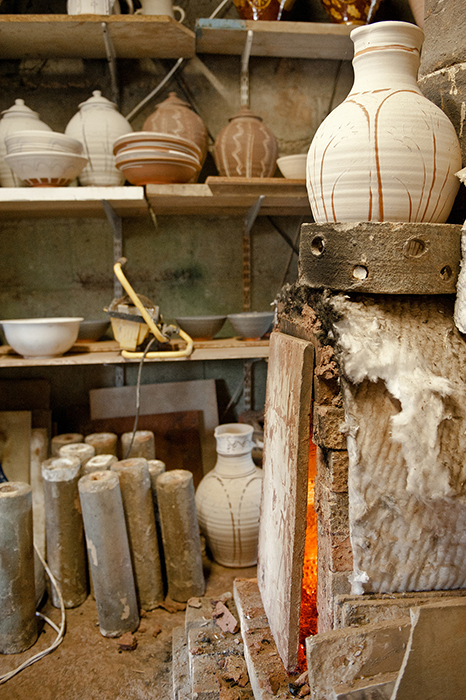 Given the importance of galleries and exhibitions to potters, how important is the internet? I think both are needed. The internet is still so young, and the idea of buying high value pottery online is still in its infancy. It’s different buying an Ikea mug, for example, as it’s a uniform product, but hand-made produces are completely different. Once people know your work, and have handled items in galleries, for example, then it’s not a problem and people are happy to buy online as they know what they’re getting. So, exhibitions and galleries are still very important to us in that respect, as when you walk into a room full of pottery, you really feel a presence from the pots, which you don’t really get with looking at photographs. It’s sad, but a number of galleries are closing due to the expense, and they’re moving over to developing their online presence. The internet isn’t just about selling though, it is also vitally important in raising the profile of potters; take myself as an example – I work in a little workshop on my own in the middle of rural Devon, yet the internet has allowed me to raise my profile to such an extent that I’ve been involved in exhibitions in Japan, continental Europe and the USA. I make little films about what I’ve been working on that day, and post them on the internet, and I have followers all over the world whom I communicate with. So as way of self-publicising the internet is tremendously beneficial. The internet also provides as an opportunity for the worldwide pottery community to support each other. I regularly receive visitors from overseas who have seen me online and stop-by at my workshop; particularly tourists from Japan. What plans do you have for the future that you can share with us? My partner, Hannah McAndrew, and I plan on working together which offers a huge amount of potential for both of us. 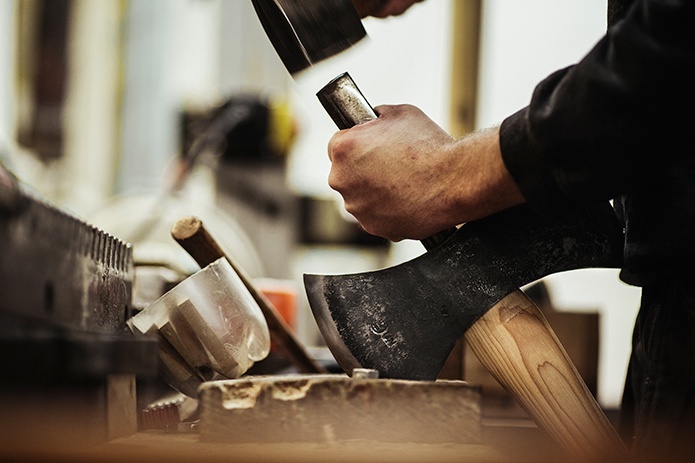 Our plan is to maintain both our workshops in Devon and Scotland, but join forces by forming a business partnership, so that we can collaborate together on work and develop this even further. Our plan is also to design and produce a range of domestic standardware; relatively affordable, but still high quality, in greater volumes than we produce at the moment; less expensive ornaments, and more functional day-to-day items. We would also like to give something back to the pottery world, by taking on apprentices, and provide training opportunities that aren’t necessarily readily available in the current climate. There’s a trust set up by an experienced potter, Lisa Hammond, called Adopt A Potter, which pays a small wage to potters wanting to learn the craft. Our hope is to do something similar, and help develop apprentices in our workshops. 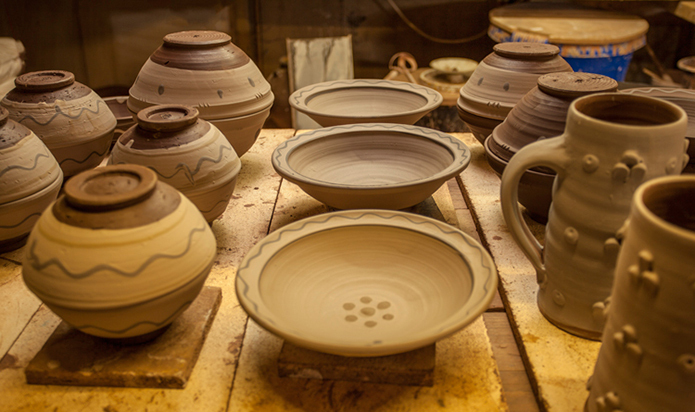 Finally, for anyone looking to embark on a career as a potter, with the benefit of your experience are you able to offer any advice that may help them? Pottery is one of those things, that if you’re driven to do it, you’ve just got to do it, irrespective of whether it’s financially rewarding or not, which it isn’t. The type of pottery I’m involved in makes for quite a precarious way of making a living, as it’s not possible to have a steady income stream. I’d advise anyone thinking about a career as a potter to spend some time and work with a potter for a while to get a feel for whether it’s right for them; there are plenty of potters who are very generous with their time and will try to help. Attending a college course is a good idea, as that helps you develop your own skills, but then I’d recommend a placement or apprenticeship afterwards, to really understand what it’s like to work in a studio pottery. 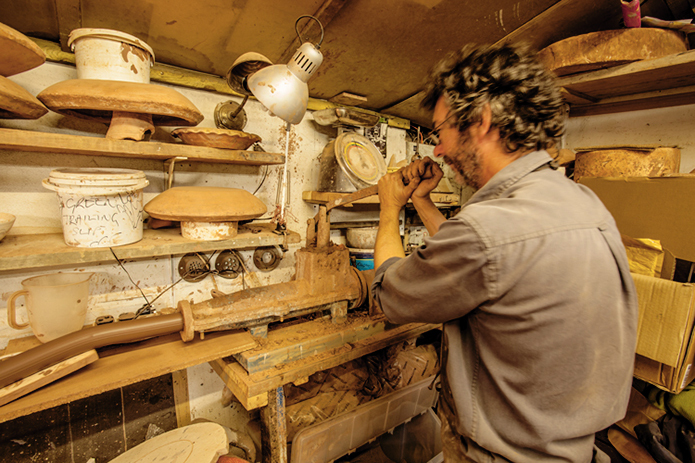 You’ll get involved in some pretty menial and mundane tasks, such as chopping wood, mixing clay etc, but that’s what being a studio potter is all about, it’s not just about throwing pots, so it’s important to understand all aspects of the craft, not just the best bits, but the stresses as well. Once you’ve completed a college course and placements, then you’ll really know all aspects of the craft, and hopefully you’ll in a position to set up your own studio.